FRP Ladders are commonly used in industrial settings to provide access to elevated locations or to allow for safe exit in case of an emergency. The need for a reliable, durable and resistant ladder makes choosing a fiberglass reinforced plastic ladder from Marco Specialty Steel a great idea. Our pultruded fabrication makes for a strong and sturdy ladder that’s always ready to be put to use when you need it. We can offer any length of ladder as well as multiple widths (including popular 12”, 18” and 24” widths). If necessary, we can also create custom widths and angles that suit your installation. FRP ladder systems have been in continuous use in chemical plants and other corrosive environment. They are also used in cases where ladder systems are immersed in liquids, like pools, deep wells, etc. 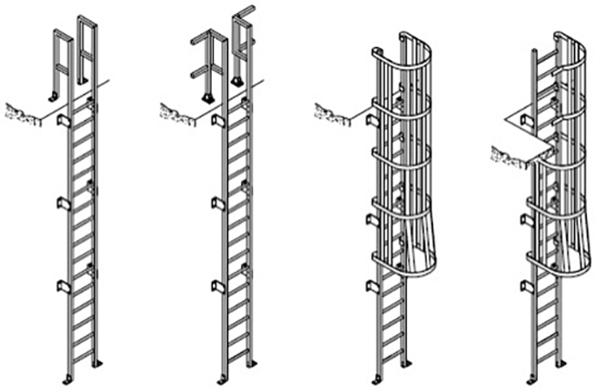 iGRID ladder system is designed as per the OSHA 1910.27 standard. Access ladders: Access ladders are usually fixed in place and are generally present to allow maintenance and inspection crews access to elevated or difficult-to-access locations. For added safety, many customers opt for a ladder and cage system. The cage helps protect the climber if they fall back, and offers an additional place to grab onto while at the top of the ladder. Safety ladders: Safety ladders don’t generally see much use, but are made available to allow people to get to safety in case of an emergency such as a fire, flood or explosion. Safety ladders need to be strong, resistant and ready when you need them. Thanks to the resistance of pultruded FRP to heat, humidity, chemicals and corrosion, our fiberglass safety ladders are suitable for all types of environments. Fiberglass reinforced plastics don’t degrade over time. This means that even if your access or safety ladders don’t get used often, they won’t let you down when you do need to use them. Other materials like wood and steel can rot and corrode, which is why these are not suitable for industrial ladder fabrication. We use both our molding and pultrusion fabrication processes to manufacture our access and safety ladders, depending on your requirements. Our molded ladders offer a great combination of value and strength and suit most general applications. If you require longer ladders with extra weight capacity for climbing with heavy loads, a pultruded ladder offers even greater performance. For extreme heat installations, we can add phenolic to our resins for increased strength. Our FRP ladders can be used in wet applications as well as in the presence of food and medical materials and clean room installations. Don’t forget to consider adding a cage for extra protection and safety for your service ladders. If one of our existing FRP access or safety ladders doesn’t suit your application, we can create a custom FRP ladder solution for you. Simply upload your drawings and blueprint files to our site and we’ll take a look. Our design team can incorporate all of your requirements and create a custom fiberglass ladder system that fits where you need it and gives you the access you need in all situations. Discover what makes Marco Specialty Steel your best choice among all FRP Ladder System suppliers in the marketplace. Contact us for more information about our FRP Ladder Systems and a no-obligation quote today.